Mobile lecterns, or portable podiums, provide an easy and convenient way to deliver speeches or informally address a meeting. They all have wheels so you can position them wherever you need and their height-adjustability means they can accommodate speakers of different proportions. In addition, they typically include storage space within the body of the mobile lectern to tuck a laptop or an HD projector, making them true multimedia units. Some users even make double duty of them as stand-up workstations! The 28 lb., Stand Up Desk Store mobile podium is our top pick- it adjusts in height from 40.5 inches to 40.5 inches high and is finished in an attractive silver gray powder-coat, with wood laminate shelving. In appearance, it resembles a slick corporate board room speaking stand- so it would be a fit in any organization or even startup. It has also received raging feedback from its buyers who say that it is an attractive and sturdy option, especially given that the wheels have locking brakes so you don't end up rolling around the room as you give your presentation. Users also say that it is easy to assemble and that the metal portions of this inexpensive podium are pretty heavy-duty. Adjusting the mobile lectern podium is not too easy- which users actually say it is pretty good because you don't want it sliding up and down too easily. The top shelf is also pretty spacious at 20.5" x 15.5" in depth, with a 17° angle. In all, this mobile lectern is an inexpensive and highly attractive option that presents a professional look with matching functionality. The 40.5″ – 48.5″ high, 28.2 lb Stand Up Desk Store Mobile Lectern Podium is an excellent option that is height-adjustable. Its users love that it is sturdy and heavy duty, but also note that the exposure to sunlight may damage the wood finish. The wood laminate shelves are heavy duty and meant for long-lasting usage. The steel frame is finished with a silver gray powder coat. Top shelf is 25.5” x 15.5” with a 17-degree angle and a stopper that prevents slippage, while the 23.5” x 7.5 lower shelf can be used for storage. Two of the 2” furniture casters have locking brakes. This steel podium is a solid option if you are looking for an affordable yet well-designed mobile lectern. Users of this Stand Up Desk are highly satisfied with their purchase. They find it very attractive-looking as well as sturdy. One user thinks it is great for classroom use, with the right amount of desk space for a computer and a way to bring the electric cord up from the inside to the computer out of the way. They also like how easy it is to assemble, and that it works well both as a mobile lectern and as a stand-up desk. The only negative comment on this product is that the vinyl covering on the wood can get damaged from sun exposure, so it is recommended to keep it away from direct sunlight. The 20.1” x 25” x 46”, 95.2 lb. Balt Mobile Floor Lectern is a well-designed option that is made of laminated wood with stylish oak or mahogany finish. Its users love its attractive construction, but also note that it’s a bit on the heavy side. Its top surface is slanted, and it has a retractable side shelf. Pull-out keyboard/laptop shelf has a security lip. An interior storage shelf provides ample space for storage. It can be rolled using 3″ casters (two locking), which are recessed to provide mobility without impairing aesthetics. This floor lectern is a nice option if you are looking for a very presentable wooden mobile podium. The general consensus by users of this mobile lectern is that it has a nice elegant design and its sturdy quality is quite good. Many users agree that it is fairly easy to assemble and that it is versatile and efficient. One negative comment on this product is that its wheels are a bit small for such a heavy piece of furniture, although most users find that moving it around was no problem. Another user also said that the construction of the slide out shelf felt pretty cheap, but it wasn’t a big deal for them. The 22” x 28.8” x 49.8”, 85 lb Safco Products 8922BL Scoot Multi-Purpose Lectern is a good option constructed with steel that has panels with unique hole pattern design. Its users love its sturdy assembly, but also note that its size makes it feel cumbersome. The top has a fold-down platform, which allows use as a flat or slanted surface. It moves on four casters, two of which are locking. Large storage space underneath is concealed by two doors, and the shelves within can be adjusted in 1” increments. Shelves, platform, and doors are made of laminate wood with a scratch-resistant black finish. It comes with two swivel cup holders on each side. This scoot lectern is a nice option if you are looking for a multi-purpose podium. 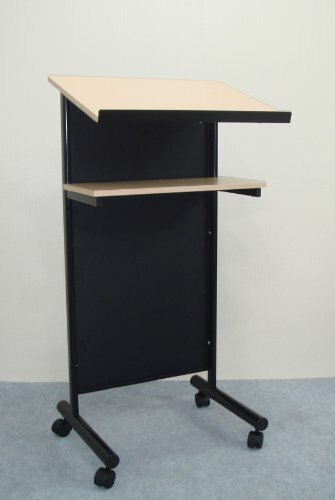 Most users of this mobile lectern agree that it is quite heavy duty yet easy to assemble. They also think it looks great and find it easy enough to roll from one place to another. Some users also like how its foldable top platform makes it versatile enough to be used as a podium, a laptop stand, or projector stand. The 47.3” tall, 30.1 lb Wheeled Lectern with Storage Shelf from Audio-Visual Direct is a practical option that is very compact. Its users like that it is lightweight, but also note that its caster wheel, though lockable, may not be adequate to keep the unit from moving when leaned on with a certain pressure. The frame is constructed with durable powder-coated steel, while the shelves are made of medium-density fiberboard. The angled top surface is 23 1/4” x 16 3/4″ has a paper stop to support documents or books. The lower shelf for storage is 23 1/4″ x 13″. This mobile lectern is a very good option if you are looking for a slim and affordable podium or laptop stand. The consensus among users of this stand is that this is a nice product for its low price. They liked how easy it is to assemble and that it is sturdy enough yet very lightweight and handy. Obviously, they are happy with its very low price point. However, one user did not like that it does not always stay in place when you apply some pressure. Another one felt that the metal rim that serves as the paper stop is pretty sharp when you rest your arms on it. The 37 1/2″ – 45 1/2″ tall, 43.4 lb Balt Diversity Stand AV Cart or Mobile Stand Up Workstation or Mobile Lectern is a superb option with a top surface whose rear half facing the speaker can be slanted down. Its users love its great build, although also note that the screws provided are not good quality. The flat area of the top shelf is 23 3/4″ x 12″, while the slanted area is 23 3/4″ x 11 3/4″. It has an 18 3/4″ x 15 3/4″ middle shelf, under which is a storage box. The flat shelves have a metal railing around them, while the angled shelf has a bracket to prevent objects from falling or sliding down. This wheeled AV stand is a great option if you are looking for an inexpensive, versatile, and compact AV mobile lectern or workstation. 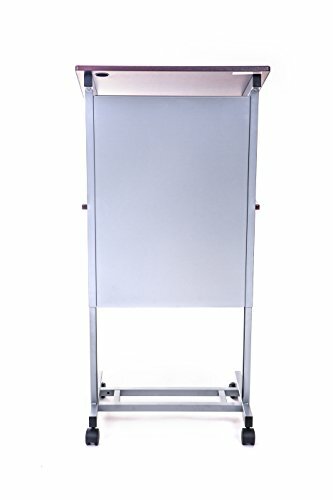 Users are very satisfied with this mobile lectern, with many of them saying that it does its job wonderfully. They love its great design, solid body, its adjustable height, and good quality caster wheels. And for its price, many users feel that it gives the best bang for the buck. Except for the cheap screws, which are easily replaced and are certainly not deal-breakers, people who use this item are happy about their purchase. Portable lecterns offer a convenient means for presenters and speakers to provide impromptu and mobile presentations at conferences, corporate boards and other speaking engagement-type events. 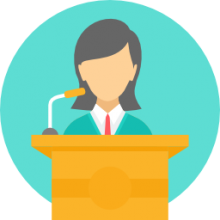 There are a variety of different styles of these mobile lecture podiums-someone made from heavy-duty steel frames, while others are made from particle board, or a combination of both with a mahogany or oak laminate for appearance's sake. Some of them even double as stand-up mobile workstations- allowing you to move around your home or office and have an easy storage space on top for your laptop or your iPad. 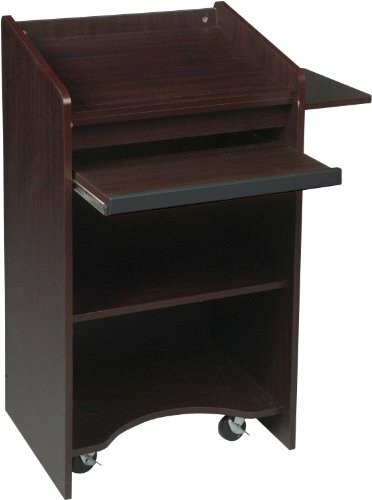 Another purchasing consideration is the sort of appearance you would like to strike- some of the mobile lecterns present a more polished and professional appearance like the Standup Desk Store mobile podium- this particular speaking stand looks like it would belong in a corporate boardroom or a well-funded startup. 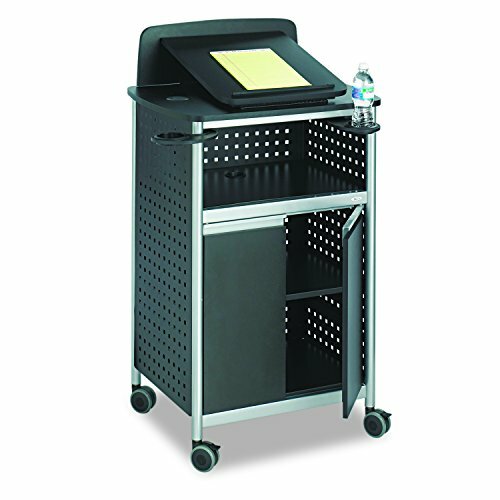 Another consideration is the sort of storage areas and capacities that the portable lectern standing desk includes- some like the Safeco Products multi-purpose lectern has a tremendous amount of storage area within its body. It is a particularly sturdy option that users say serves a variety of storage and speaking purposes, with the additional shelving providing storage space for laptops, HD projectors, HDMI cables, phones and any other business accessory you can imagine. One other feature you should keep an eye on is the height adjustability of the mobile lectern- you will want to make sure if you have particularly tall or short speakers that the height adjusting range is great enough to accommodate either of them. These find a variety of different uses- with one reviewer saying that they purchased the Balt mobile like turn to position and the Welcome Center of their synagogue. Because this particular mobile lectern has a pretty sturdy and impressive look, it's appearance is a natural fit for the interior of a religious center. Another user purchased one for her elementary school classroom- saying that it is a handy workstation, and is a great way to coordinate class presentations, providing enough space for a bunch of young students to gather behind it and deliver their talks. 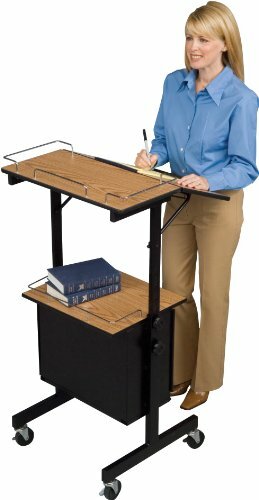 In all, if you are looking for a convenient and mobile solution to presentations in your organization, public school classroom, or just at home to use as a stand-up desk, one of these mobile and portable speaking stands could be a solid option for you.